Bilbo’s Eleventy-first birthday is bash is quickly approaching! Want to be the fairest Hobbit-girl there without breaking the bank? Let Yankeegirl show you how! 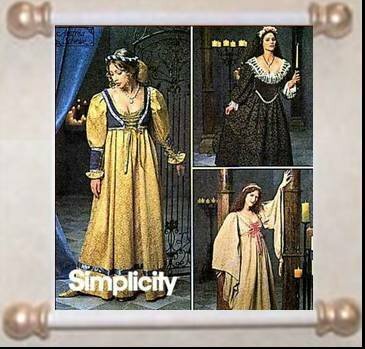 For the basics of the pattern I used Simplicity 8192. The pattern numbers may have changed, however, on Simplicity’s site you can do a search and find the pattern with that number. I raised the collar so it wasn’t so low cut. Paper works well for doing this. I pinned the pattern together and cut out a sheet of paper until I had the appropriate collar height. You can either add lace to the collar or do a ruffle. For a ruffle I recommend that you measure the length of the collar and cut a strip of material three times the length. I folded the fabric for the ruffle into two and gathered it. I cut the sleeves above my elbow. I stitched bias tape across the sleeves and ran half-inch wide elastic through that. For the skirt there are two different ways I found to go around it. One, you can shorten the dress and make a separate skirt. If you want to do it this way, find your favorite skirt pattern that has a waistband This would come in handy if you want a multi layered skirt. Or, you can choose to not shorten the dress, and add elastic to the waist. Either way works. With the bodice I turned the front pieces into back. I traced them onto paper and adjusted to fit. With the back I lowered the back of the neckline and slashed it down the middle. I would certainly suggest trying a test first. It can always be adjusted to fit. For the circle key hole, I traced a glass onto the pattern and cut it out. A piece of ribbon and a fancy bead or button will finish off the look as a lovely Rosie Cotton-style choker.